Tracking sales activity—knowing where a prospect is within the buyer’s journey to understand the relationship dynamic—has always been and will continue to be top-of-mind for any modern sales person. With the abundance of data in a tech-heavy world, it also doesn’t any easier. Here at Outreach we’re always on the mission to help sales people master their craft and enjoy doing it. And that includes the team that makes sales possible—all the way from sales reps to sales operations and marketers on the front line. A common challenge that many people in the sales realm come across is not being able to have full visibility into the buyer-to-seller conversation. Thankfully, there are solutions like BCC to Salesforce that have sought out to solve this problem in the early days of modern sales. What is BCC to Salesforce? 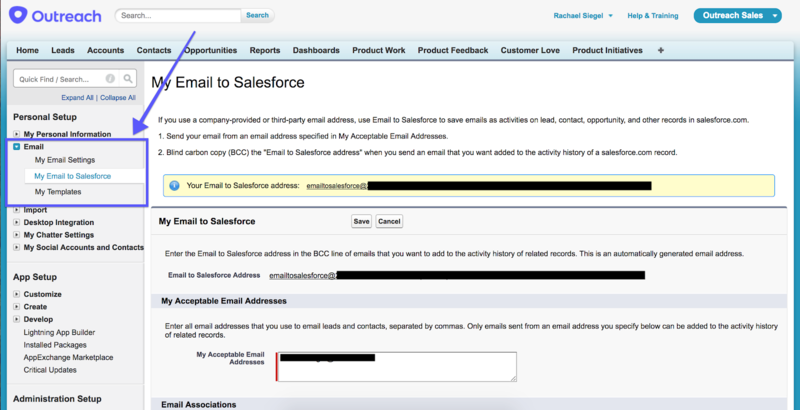 Logging emails into your Salesforce CRM records. Before BCC to Salesforce emailing—and having it logged into the appropriate records—outside of your Salesforce instance wasn’t possible. Every email sent using BCC to Salesforce gets saved where it needs to be for you to keep records and utilize in future interactions. Being able to use it on any device and no downloads required. First, ask your Salesforce administrator whether you have BCC to Salesforce enabled. 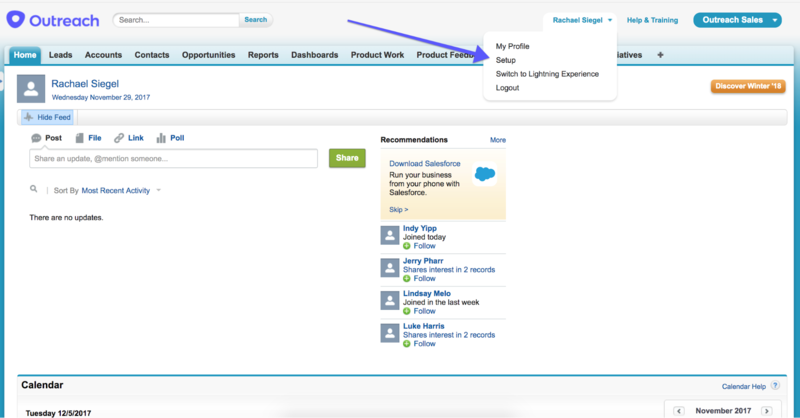 Next you’d have to find the designated email within your Salesforce instance by going into your set up through clicking your name on the top right side of the instance. You’ll then click into “My Email to Salesforce” where you’ll find your automatically generated email address link. Once you’ve obtained your designated email, go ahead and create a contact to associate the email address with for easy access. 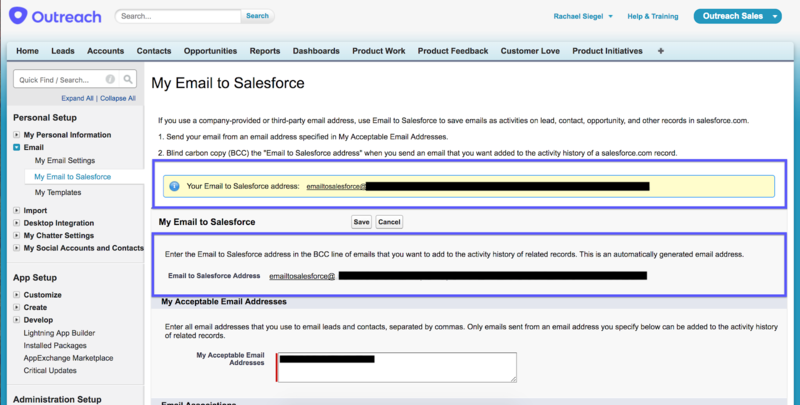 Now, you should be able to quickly add the BCC to Salesforce contact to any email you send regardless of client. Find your user name at the upper right corner and select the drop down bar. Select "My Settings" or "Setup" from the drop down bar. Having to manually—and consistently—add the email in BCC. One flaw in relying solely on BCC to Salesforce alone is that sales reps may not always add the designated email as a blind carbon copy. They may simply forget or not have time. You only end up having visibility into half of the conversation. Since the email tracking is dependent on the sales rep adding the designated BCC to Salesforce email as a recipient, any emails being sent from the prospect are not logged into the Salesforce record. The setup can be lengthy. Now imagine if you have 10’s to 100’s of sales reps on your team. Having to manually go in there and have the rep transfer the designated email link over as a saved contact can be tedious onboarding especially for newer reps. Rather than spending valuable time on operational logistics in the software they use, they could spend more time actually building relationships with prospects and customers. Luckily in the modern era of the sales stack, there are solutions out there to give sales reps the freedom to focus more on selling without having to worry about adding Salesforce’s designated email to BCC, yet still produce the same results, if not better. If you're looking for a solution to help you and your team track activity across email and phone automatically—and can integrate with many other applications, check out Outreach below!